Orlando, Beth, Lori and I went to lunch at Bob Evans Tuesday. I was tired and/or hungover from the Ohio State loss to Florida. The second such hangover this year. On our way in, we noticed that the walls were papered with crayon colored Easter Bunnies. Some were colored A+ and some looked like a preschooler colored them. I was then reminded that many of them were colored by preschoolers and I quit with the criticism. 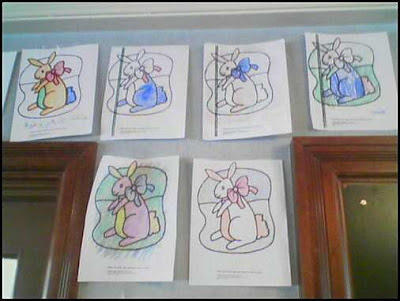 I did notice that this particular Bob Evans ran out of the supplied Easter Bunny coloring pages and had to make duplicates on their crappy fax/printer/copier that is covered in grease back in the Assistant Manager’s cubbie. The crappy copies have dark lines down the left side. But I’d rather like to think that the lines aren’t lines, but rather a stripper pole. Take it off, Easter Bunny. Bawk, bawk. That could make me rise from the dead. I think I saw the one with the blue ribbon at the Crystal City Restaurant one night. That was one dirty bunny.